The long weeks of summer fun stretch ahead of you that sure excite your kids even more! Finally, the family will have more time to spend together plus the kids need not to worry about homework. Have you make a list of great ideas for them to spend this summer? Make sure to include in their calendar a rewarding time for themselves just like how we reward ourselves too - a time to chill and be pampered! This allows them to recharge from all the stressful weeks at school and prepare for a busier summer activities. 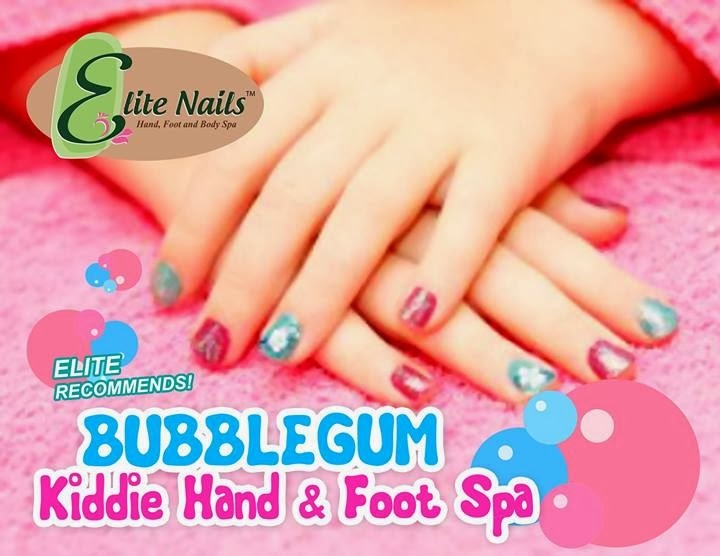 Elite Nails Spa welcomes your little ones to a different kind of pampering experience with our Bubblegum Kiddie Hand and Foot spa. This spa package is tailored for children and we have trained staff knowledgeable of the kids' sensitive and delicate skin needs. Your special little one will surely enjoy our all natural hand spa as we give her little arms and hands a quick bath, a gentle scrub, cooling mask and a soft massage - all smells delish with bubblegum-scented products, capping it off with a nail polish application. Have peace of mind that our nail polish is generally safe for kids and also for the environment. For her delicate footsies, let your kid enjoy a mouthwatering bubbly foot soak followed by foot and leg scrub, mask and massage, finishing with a 100% non toxic polish. You can also get updates on new treatments and services and upcoming promos from our Facebook fan page: https://www.facebook.com/EliteNailSpaMain and follow us on Twitter: https://twitter.com/eliteNailsSpa.